A legendary monster with many heads, sent by Hades to fight Hercules. If you cut off one of its heads, two more grow back. A legendary creature sent by Hades to destroy the Olympus Coliseum and Hercules. 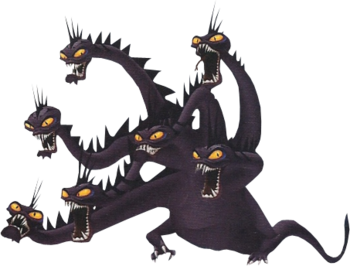 The Hydra is a multi-headed monster that appears in Kingdom Hearts II. It is fought at Olympus Coliseum and originally appeared in Disney's 1997 animated feature, Hercules. Hades sends the Hydra to destroy Olympus Coliseum and kill Hercules. The hero battles and seems to defeat it, but the Hydra merely fakes its death and proceeds to destroy the Coliseum while Hercules is away. The Hydra meets its match when Sora, Donald, Goofy, Phil, Pegasus, and Megara team up to eliminate it once and for all. The Hydra is a massive, reptilian creature with dark purple skin. It has a bulky body, and it crawls using a pair of four-fingered hands with white claws. The Hydra's tail is long and thin, and each time one of its heads is cut off, two more grow back as a replacement. All of the Hydra's heads are identical; they sport long, serpentine necks, large mouths filled with white fangs, and orange eyes with slitted pupils. Spikes line each of the Hydra's heads and necks. In the Japanese version of Kingdom Hearts II, the Hydra spews green blood when one of its heads is cut off. In other versions of the game, the blood is changed to purple smoke except in one cutscene. The Hydra is named after the Lernaean Hydra, a serpent-like water monster in Greek mythology. Killing the nine-headed Lernaean Hydra was one of the Labours of Hercules. Phil One-Two: When the Hydra buries its head underground, Sora must climb onto the creature's back and use this reaction command. This causes Phil to throw an urn into the air as Sora leaps towards it. Urninator: After Phil One-Two, using this reaction command causes Sora to strike the urn Phil tosses with his Keyblade. The urn collides with the Hydra, stunning it for a short time. Pegasus Run: Using this reaction command causes Sora to mount Pegasus and fly towards the Hydra's heads. Attack: This reaction command is available after Sora uses Pegasus Run. It causes him to strike the Hydra's heads with his Keyblade. Vanquish: This reaction command becomes available after Sora fully depletes the HP of one of the Hydra's heads. Using it causes him to slice through the Hydra's neck and defeat the targeted head. "Defeat the Hydra! Fight alongside various friends!" When fighting the Hydra, in addition to having Donald and Goofy in the party, Sora will have Phil, Megara, and Pegasus for support. Phil tosses urns that can stun the Hydra, Meg gives Sora much-needed HP, MP, and Drive orbs when he gets close to her, and Pegasus allows Sora to use the Pegasus Run reaction command. Sora must first attack the Hydra's main head. When the head's HP is fully depleted, he must use the Vanquish reaction command to remove it. After this is done, the Hydra buries its head in the sand, causing three more heads to sprout out from underground in various locations. By teaming up with Phil, Sora can use the Phil One-Two and Urninator reaction commands to immobilize them. Sora must defeat each of these heads and use Vanquish on them before they awaken. In the final phase of this battle, the Hydra pulls its neck out of the ground and reveals a set of seven heads. Sora can team up with Pegasus and use the Pegasus Run reaction command to strike each head. Once the Hydra's HP has been fully depleted, Sora need only use the Vanquish reaction command a final time to finish the monster off. If the Hydra manages to defeat Sora, the option to revive him using King Mickey may become available. Victory grants Sora access to the Thunder spell, as well as the Hero's Crest Keyblade. The Hydra first appeared in Disney's 1997 animated feature, Hercules. In the film, Hades ordered his minions, Pain and Panic, to disguise themselves as little boys and pretend to get trapped under a large boulder. He then used Megara to lure Hercules to their location. Hercules removed the boulder to save the "boys," but in doing so, he accidentally unleashed the Hydra. After a brief struggle, the monster managed to swallow Hercules whole. The hero escaped death, however, by cutting off the Hydra's head from the inside, which seemingly killed the beast. Before Hercules could celebrate his victory over the Hydra, the creature's corpse came back to life and sprouted three more heads. Hercules resumed his battle with the Hydra, and as the fight continued, he came to realize the more heads he cut off, the more grew back to take their place. Eventually, the Hydra managed to pin Hercules against the side of a cliff. Faced again with elimination, the hero used his godlike strength to cause a rockslide and slay the Hydra once and for all. ↑ The Hydra's heads have only 71 HP. This page was last edited on 18 January 2019, at 10:45.